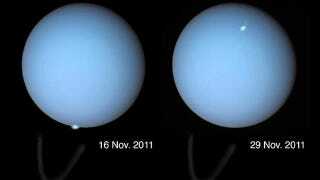 Outside of Earth, we've seen auroras on Jupiter and Saturn, but never on Uranus. Now, for the first time, the Hubble Space Telescope has photographed two auroral storms, each as large as the Earth. NASA's Voyager 2 probe detected signals of auroral activity when it passed by Uranus in 1986, but astronomers have never been lucky enough to snap a photo of an auroral storm. Because the storms appear only momentarily, a combination of planning and luck is necessary to photograph them. In September 2011, a team lead by the Observatoire de Paris' Laurent Lamy learned of an impending solar storm and managed to capture two of the brief storms. Lamy believes the short-lived nature of the Uranian auroras may be related to the planet's unusual magnetic and spin axes. Since Uranus' magnetic axis is 60 degrees off from its spin axis and its spin axis is tilted 98 degrees relative to the solar system's orbital plane, the solar particles hit the planet at a different orientation from its magnetic field. So photos like these aren't just an astronomical first; they may also offer further clues to the mysteries of Uranus' unusual magnetic field. Lamy hopes he'll be able to capture more of these auroras before Hubble reaches the end of its lifespan.